Disclosure: I received a complimentary ticket to Alice’s Table flower arrangement workshop in exchange for social media coverage. I was under no obligation for a review, but wished to document my enjoyment. All opinions are my own. It’s no surprise that I love flowers. I LOVE flowers! I have a collection of roses in my landscape that I hope continues to grow in numbers. So when Nicole invited me for a girls’ night out at a flower arrangement workshop (where I got to take home flowers) I was ecstatic! If you’re looking for a unique, fun and social activity to celebrate a special someone (or even just to treat yourself), I highly recommend Alice’s Table in Jacksonville. If you’ve never heard of Alice’s Table before, you’re not alone. Founded in 2015, Alice Rossiter Lewis created a business that brings women together to learn new skills, and live a social and creative lifestyle. Alice’s Table is a flower arrangement workshop where you can let your creativity shine. 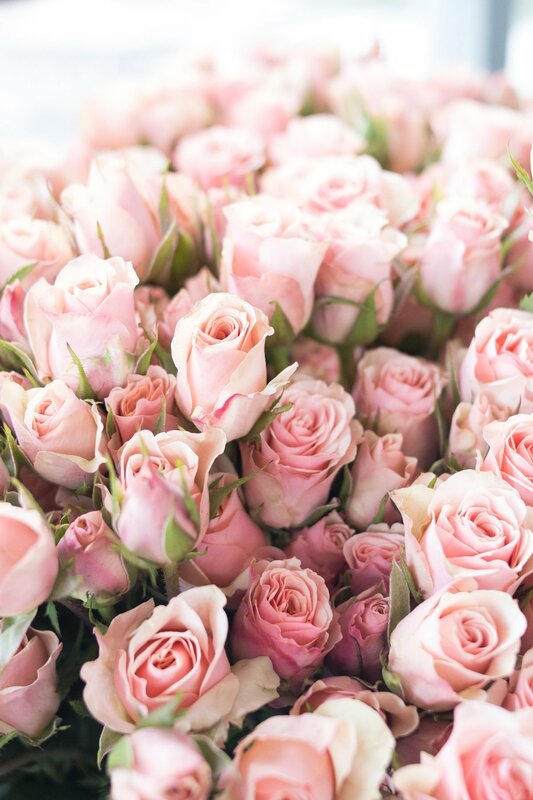 Not only do you walk away with beautiful blooms, but you also learn how to create gorgeous flower arrangements. 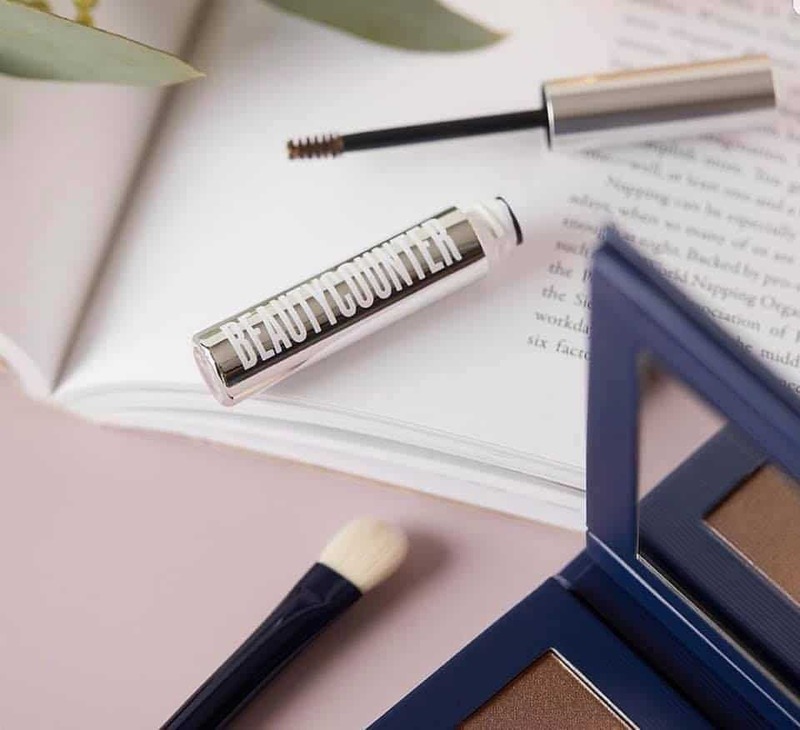 Earlier this year, the company was featured on Shark Tank, where the founder partnered with entrepreneurs Mark Cuban and Sara Blakely to expand the business. Where can I find Alice’s Table? 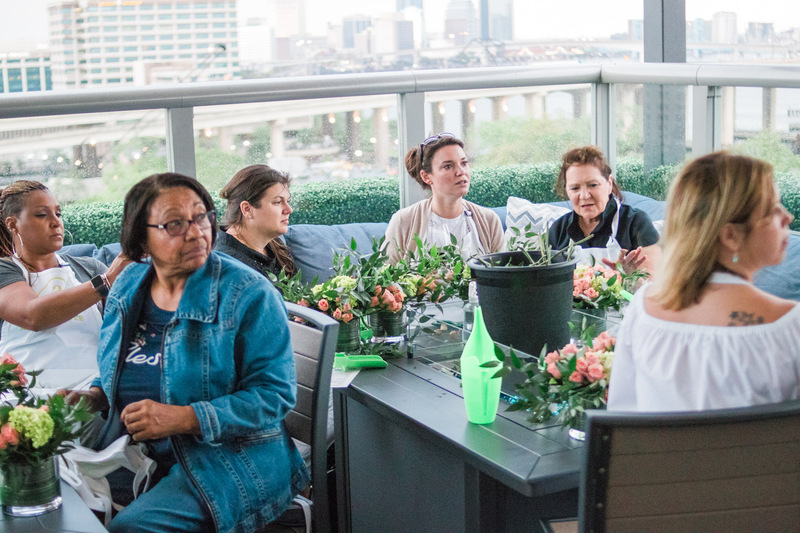 The flower arrangement workshops take place in a variety of venues like restaurants, hair salons, jewelry shops, or any location that is sure to provide a great girl’s night out. My workshop was at the amazing River & Post restaurant in the Riverside neighborhood of Jacksonville. You can find and book upcoming events on Nicole’s page. There are two events happening on Mother’s Day, so if you haven’t yet found the perfect gift, look no further! Nicole and I both share a background in the arts. She’s an accomplished Broadway dancer, and in addition to touring on cruise lines, she has also appeared on SNL. So when I learned she was going to be the instructor, I immediately felt that artistic connection. True to her background, she moved with grace between tables, and I actually caught a twirl (or two) with my camera. She’s a natural teacher, and having a performance background also helps. I had a blast! Your Alice’s Table hostess provides everything you need to have fun. Every seat has a vase, a cute apron, clippers, and rose strippers. Your hostess provides all the flowers, plant food and instructions. Depending on the venue, you can also BYOB or order cocktails. That evening, we were creating a floral arrangement called “Heavenly Heather.” Comprised of spray roses, green hydrangeas, white tulips, gorgeous flowers called “stock,” and of course, purple heather, these flowers were a joy to behold. I couldn’t wait to get my hands on them! Loved meeting Megan and Vicky from JaxMomsBlog! Remember the social aspect of this workshop? I met several hilarious women at the event, and it didn’t hurt that we had wine and cocktails to make things interesting! We all loved our aprons and the rose “shucking” tools (pretty sure I made up that term). I loved the excitement and the feeling of camaraderie between friends and acquaintances alike. Everywhere you looked, you saw women having a good time. Cost depends on the number of people in the party, and whether or not you’re booking a private party, but expect to pay around $65. I’ve seen ready-to-order arrangements easily cost twice as much, but you don’t get the social atmosphere or the knowledge gained from an Alice’s Table event. Personally, I much prefer the activity. Nicole walked us through every step and made it super easy. Even though we were all working with the same medium, all of our arrangements were unique. I thought it was amazing how every arrangement had our own personal flair. All in all I LOVED my experience with Alice’s Table! I’m glad that there are independent execs all over the country, so if I plan a visit to Maryland, I know there will be local events when I visit family. 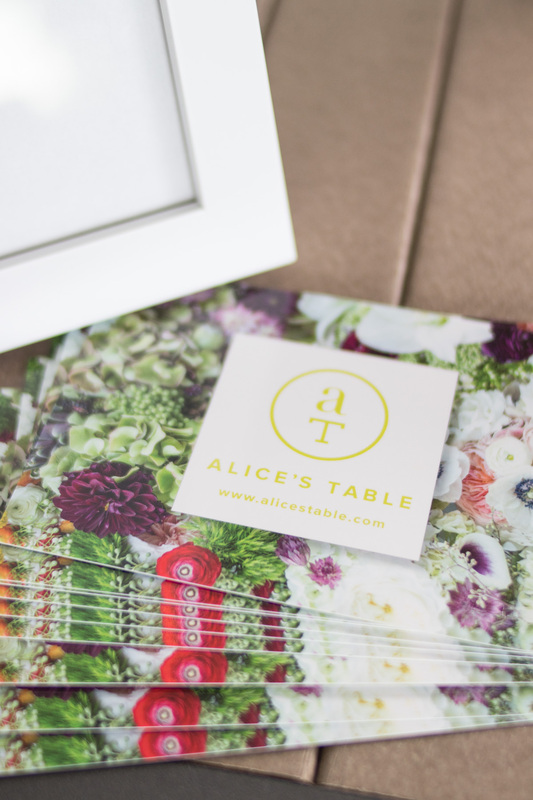 Be sure to find an Alice’s Table event near you! Have you ever attended a flower arrangement workshop?